INDIA'S FIRST INTEGRATED BOOK FOR JEE MAIN & ADVANCED TOPIC-WISE QUESTIONS IS A MUST FOR EVERY ENGINEERING ASPIRANT. 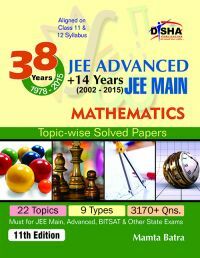 • The book "38 Years IIT-JEE Advanced + 14 yrs JEE Main Topic-wise Solved Paper MATHEMATICS" is the first integrated book, which contains Topic-wise collection of past JEE Advanced (including 1978-2012 IIT-JEE & 2013-15 JEE Advanced) questions from 1978 to 2015 and past JEE Main (including 2002-2012 AIEEE & 2013-15 JEE Main) questions from 2002 to 2015. • The book is divided into 22 chapters. The flow of chapters has been aligned as per the NCERT books. • The students are advised to attempt questions of a topic immediately after they complete a topic in their class/school/home. The book contains around 3100+ MILESTONE PROBLEMS IN Mathematics. 3. Quality Solutions - Step-by-step solutions to each and every question.